It's been a bit since I posted, I know. 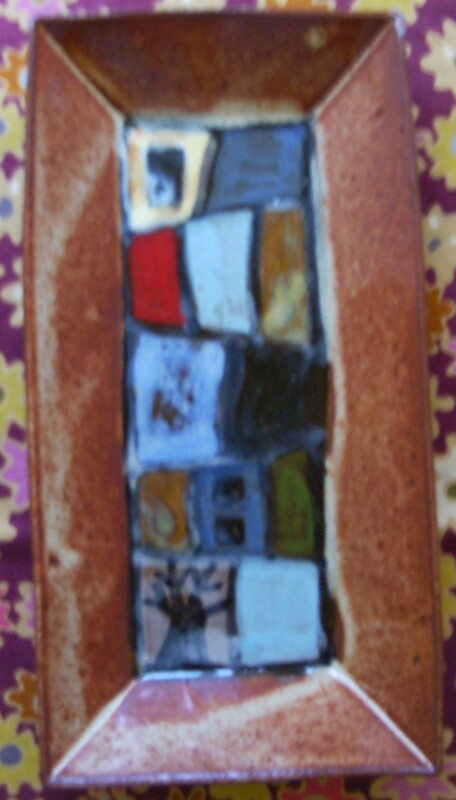 It's been on my mind, but with preparing for the yard sale, painting, and attending appointments, I've been lax. Also, I've been spending a little more time on my email at night corresponding with my daughter who would just be getting up in Korea. Right now, until she gets her phone and internet, she is using a friend's internet. Once she gets hers and settles in to her work, we will be communicating perhaps less and in different ways. I am looking forward to seeing some pictures of the area where she lives. If anyone is interested she is going to blog about her year in Korea. I will add her to my blog roll on the side bar. I've also been doing of little bit of this with my husband for the first time in my life. It's been on my mind that August is the anniversary month for my 1st year of blogging, and I've been pondering what I could do for a giveaway. After my yard sale yesterday, during some down time here in my studio, I started going through some baskets that hold bits of stamping and painting projects. I got an inspiration to use 2 of these tree designs that I screen painted last fall. The hand of the print is a little stiff as I used paint (it is fabric paint) mixed with a medium. I added a small border and then I couldn't decide between the bright batik or the more calm batik to finish them. 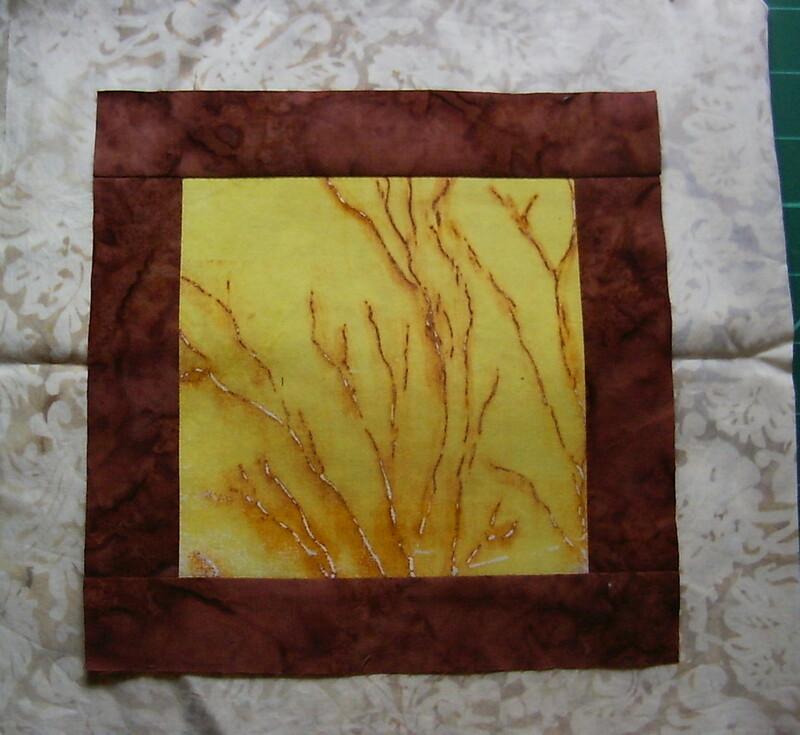 It will make 2 approximately 12 inch blocks which would do nicely in a bag or as cushions. So, I've decided to offer these 2 blocks as a giveaway and the winner can choose one of the 2 colors for the next border. There is one small catch. 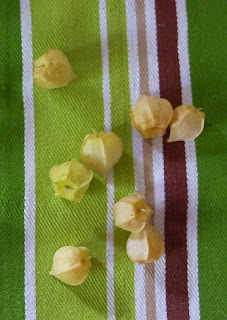 The following picture is of a something I just learned about and grew in my garden this year. They are funny looking but delicious. I'd like to hear your guesses as to what they are. If you leave them in the comments along with your choice for the next border on the squares, I will choose a name randomly. Since it is now almost the end of August, i will accept comments until Saturday 4th, 4PM my time. I've decided to spend this day cleaning, sorting and finishing odd jobs like my front door. 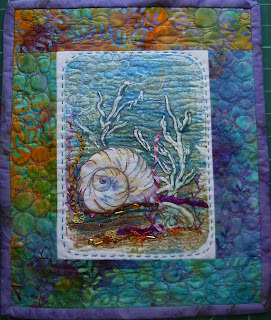 I will not be doing a whole lot of creating or sewing this week as I need to make some space in my small home. This is the new color of my front with one final coat to go on this morning. Yesterday, at 6:30 AM we watched our daughter take off in a little plane on the first leg of a journey that will take her more that halfway around the world to South Korea where she will be teaching. We then made the 3 hour trip home with 2 cars loaded up with everything she was leaving behind. My drawing and painting space downstairs now looks like a messy storage room. I am planning to spend this week sorting and pricing for a yard sale and trying to find a space for the boxes that are 'keepers'. I am really beginning to get into the world of texting as all my children and my husband have blackberries, and so they are able to text at no cost. At every landing on her way to Seattle yesterday--Montreal and Vancouver-- my daughter texted us about her trip. Finally, when she reached Seattle where she is doing some training before leaving for Seoul on Wednesday, we texted back and forth for a couple hours while she went for dinner and then a walk. What a world! So, I think you will understand why there won't be too many creative pictures going up this week. 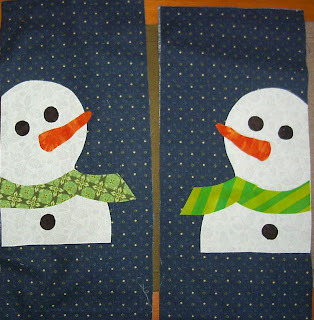 I have this one picture to show of these snowman pillow wraps (Thimbleberry pattern) that I cut and fused the other day as a start on some Christmas gifts. Well, I opted for the drug plan and the endoscopy was easy. However, the doctor announced that my throat was narrow and he proceeded to insert a contraption to stretch it. That was uncomfortable for a bit and I've got a sore throat like nothing I've ever had before; I've been taking pain meds every few hours and it's difficult to anything more than mush. My favorite mantra lately is,"This too shall pass". This doctor doesn't come to see you after the test; i was given a prescription (not knowing for exactly what) and sent home. So, upon checking it out on line I find out it has an interaction with another of my problems and i shouldn't take. the pharmacist agreed, but the doctor's receptionist advised that I will have to wait the 5 weeks until my next appointment with the doctor. I've done a little research on the condition the drug is for, so I have a little more insight into how to eat at least, but this waiting is frustrating! pockets to make them double. I added a button to cover the tuck and did a buttonhole stitch over the seam. It sure cleaned up the back of the door and it has room for lots of stuff. 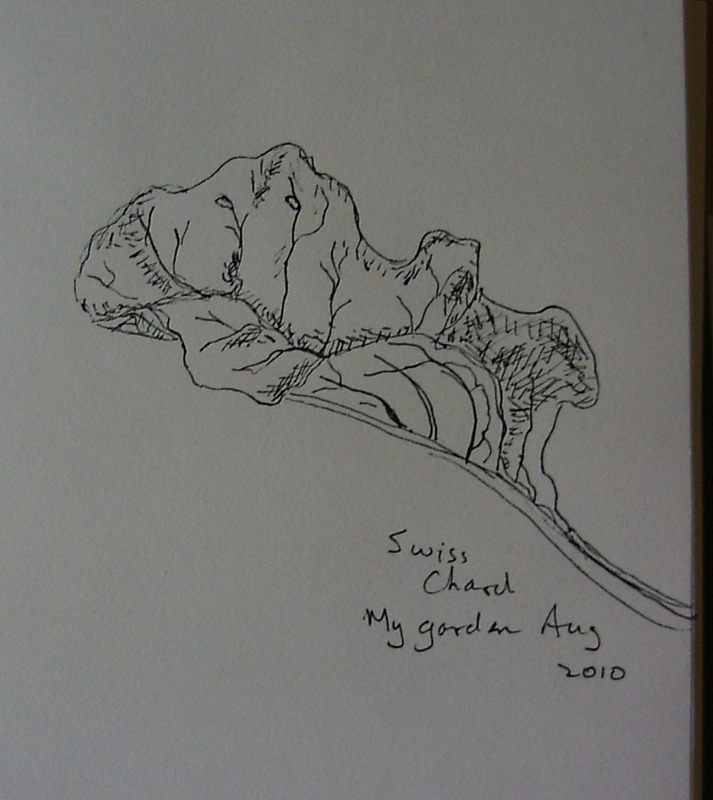 This is a quick pen sketch that I did of Swiss chard form my garden just before I cooked it. 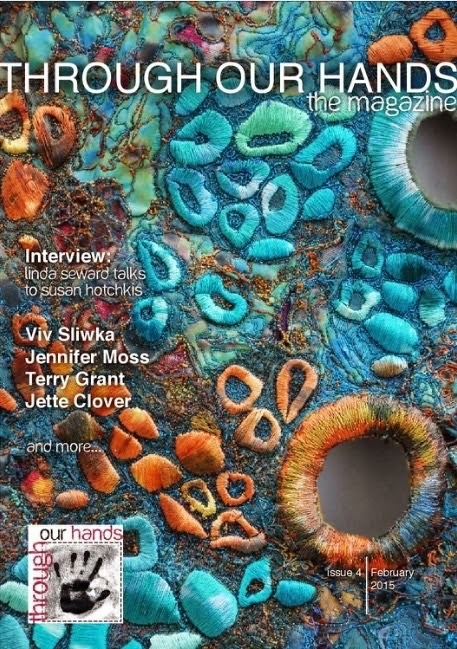 There was a very good article in the latest Quilting Arts about taking simple line drawings of everyday items and transforming them into semi abstract and colorful quilted pieces. It was called 'finding your unique design' by Terry White. I found it very instructive and inspiring and would like to try it out. I'm going to be on the look out for some things to draw that would be fun to work with in fabric. As I mentioned in my last post, there may not be much sewing going on here in the next little while. Things have gotten busier since then too. I had a call yesterday for a cancellation of an endoscopy tomorrow morning, and I quite happily accepted. It's hard to believe that a person could be anxious to do something like that, but you just get to a point where you are so tired of the pain that you'll do anything. Yesterday, I hung up my little tree house from my son, and put my little pottery gnomes from Branch Designs underneath it. It makes me smile. 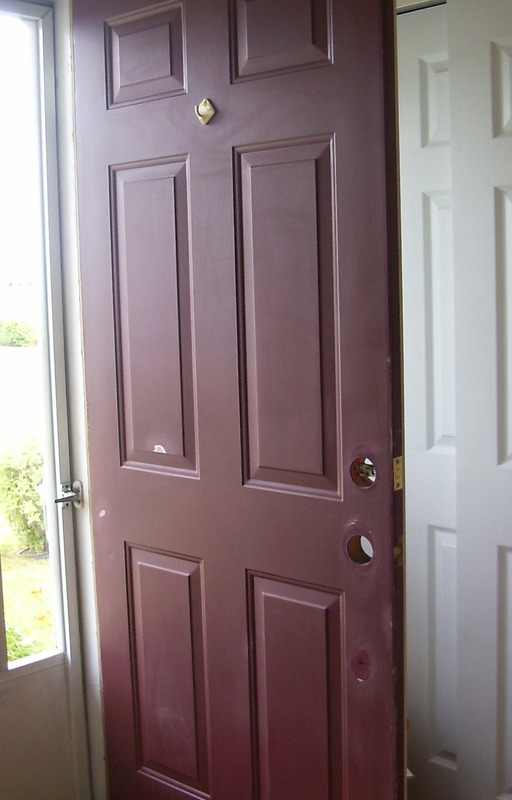 In place of my morning exercise, I sanded some spots on this exterior door and painted the inside of it white. Today I have sanded the outside and I'm shortly going to paint it. 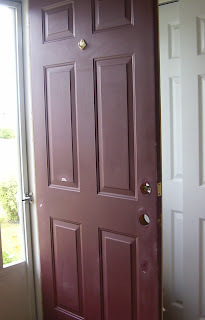 The burgundy color is really faded and we surely need a new door which is not in the budget at the moment, so I'm painting. I felt the need for a change of color and since our house is white with green shutters, I'm limited. Also, I had to buy Tremclad rust paint and there aren't many options in that. I'm going to try what I hope will be a nice gold color; I haven't opened the can yet. While paint supply shopping last night, I found this shoe bag hanging. 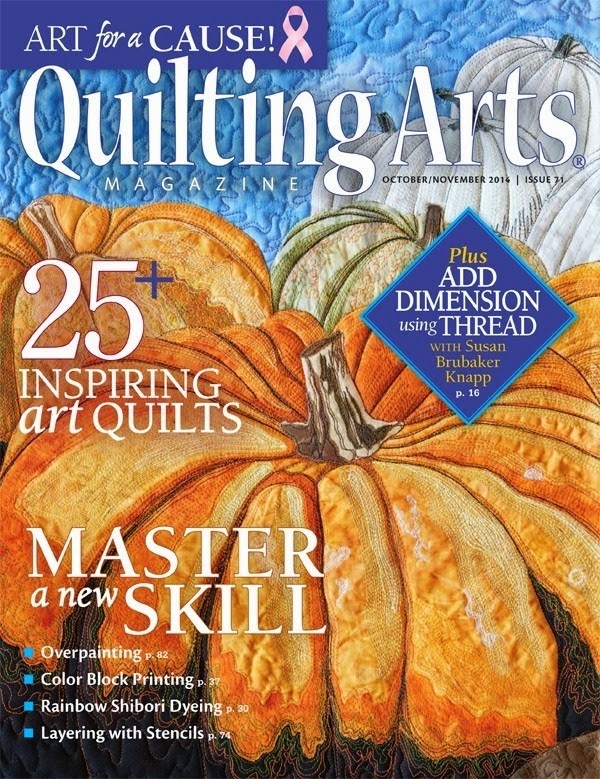 I've been looking for one for a while for the back of the closet door in my sewing room. There are just too many hooks on it with all manner of stuff hanging there. 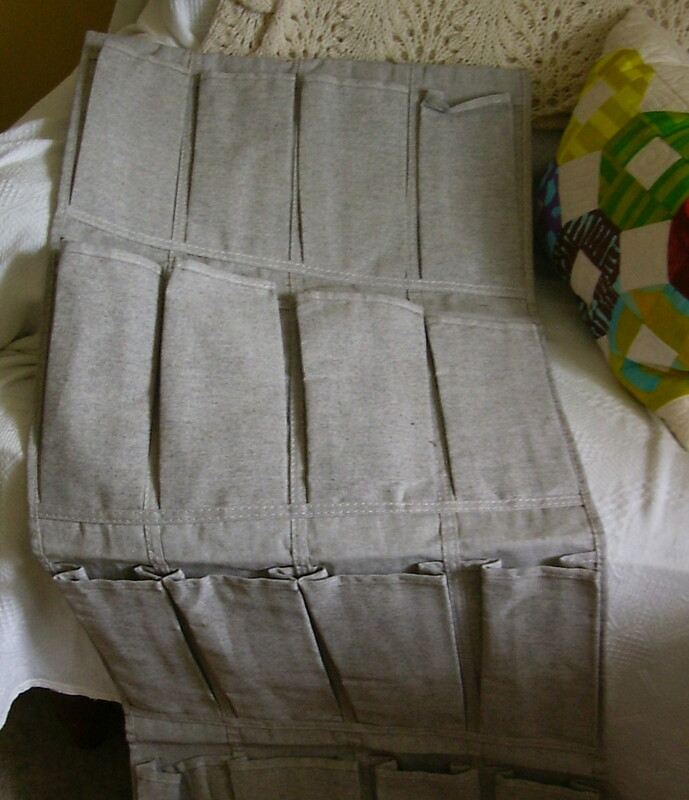 My plan is to cut a few pockets open and resew then too make them double size. I saw a very colorful one on someone's blog (sorry I can't remember) that she made herself. I considered it, but just don't have the time and patience right now. I believe I'll try to 'fancy' this one up some though. I'll let you know how it works and take pictures once it's up. Wow, it's been another absolutely beautiful weekend! Yesterday, my daughter arrived for a one night visit to see her grandparents before she leaves for Korea next week. She brought a car full of boxes that we will be storing to add to the 1/2 dozen we have already and more to come next week. I believe I be will doing a yard sale later on, for some things she doesn't want to save. We had a perfect couple of days, spending most of yesterday at the beach with her grandparents. We also walked the sandbars and swam. 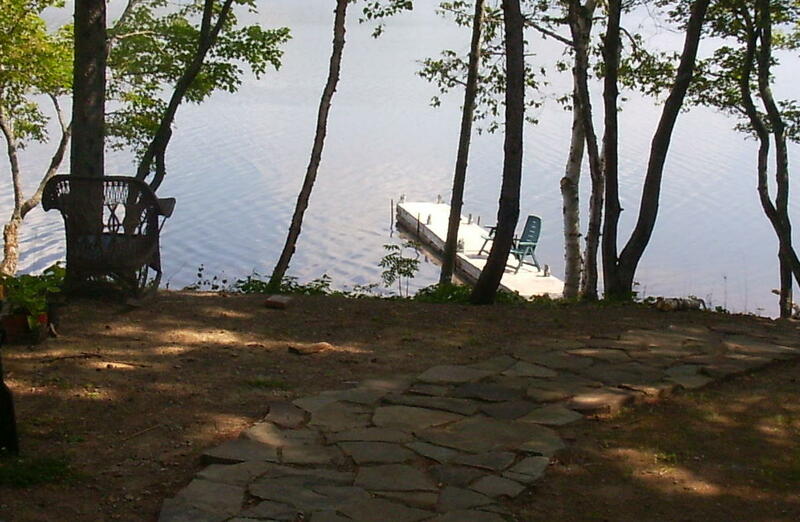 The water was warm and calm and sparkling, and the three of us stayed in for some time. After dinner she and her father took the kayaks for a paddle. 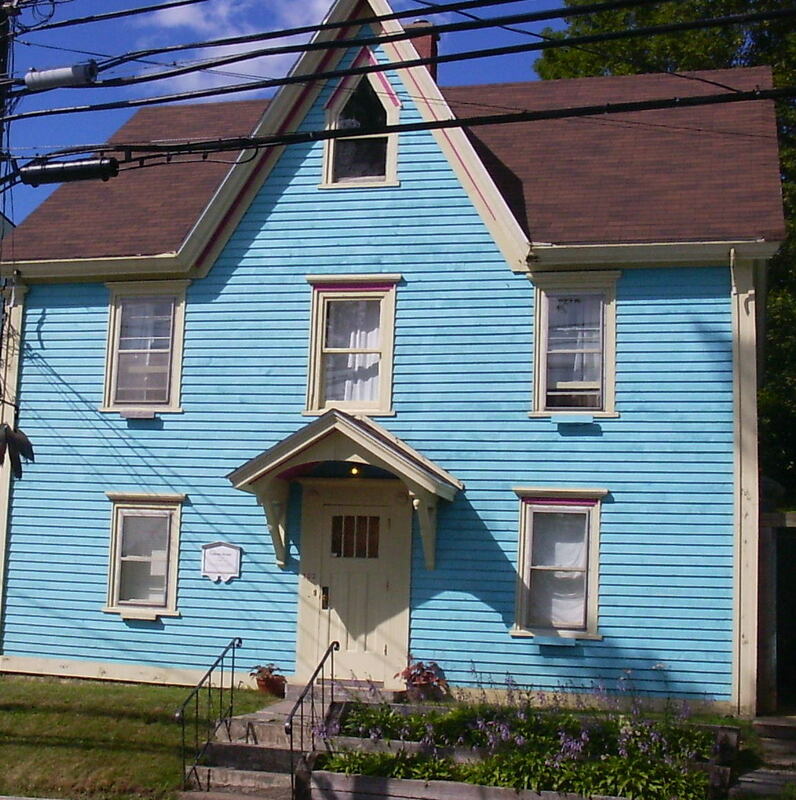 This week may be a bit busy for me as I plan to visit a friend at a cottage one day, maybe touch up the front door if it's not too hot, and I have a doctor's appointment with the specialist in Campbellton on Friday. Last Friday the 13th was my lucky day as I also got an appointment for my CT scan of the stomach. It's in 2 weeks. I am so anxious. I will try to post again this week , but I just don't have anything interesting to show since I've been and will be busy. Also, I've been quilting my little challenge project which i can't show. This is my kind of sunny summer day-- warm in the sun, cool in the shade with a gentle breeze rustling through my apple tree. And, I was actually awake and functional today. I say that because I passed most of yesterday in a lazy stupor, barely able to move. At this point since I haven't had all my tests yet, I'm guessing as to what to eat. Yesterday, I did my usual morning exercise and ate very carefully, but halfway through my salad with trout on top, I could feel the the fog moving in; it stayed there for the rest of the day. At supper time I told my husband that I had called his doctor and left a message asking for a new appointment, but they hadn't called back. He said that they must have since I left him a message at work with the new date. I didn't remember! Today, I was wary as I sat and chewed my mini pork loin sandwich with a side of veggies for lunch. I made it through lunch with my sanity intact. 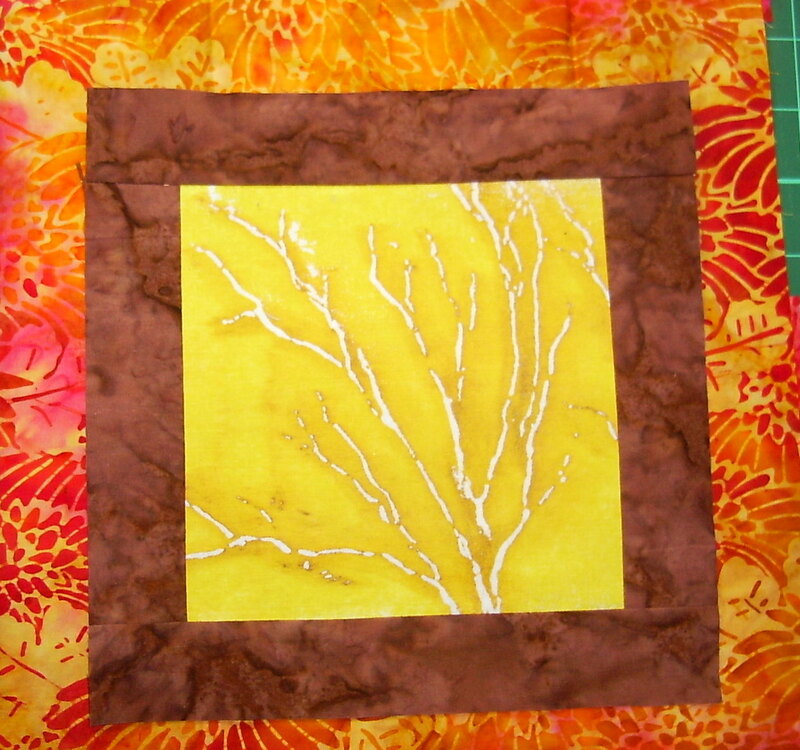 I moved into my studio and whiled away an hour cutting pieces for my little challenge project. I'm very happy with it, but alas, it's a secret for a few more weeks. 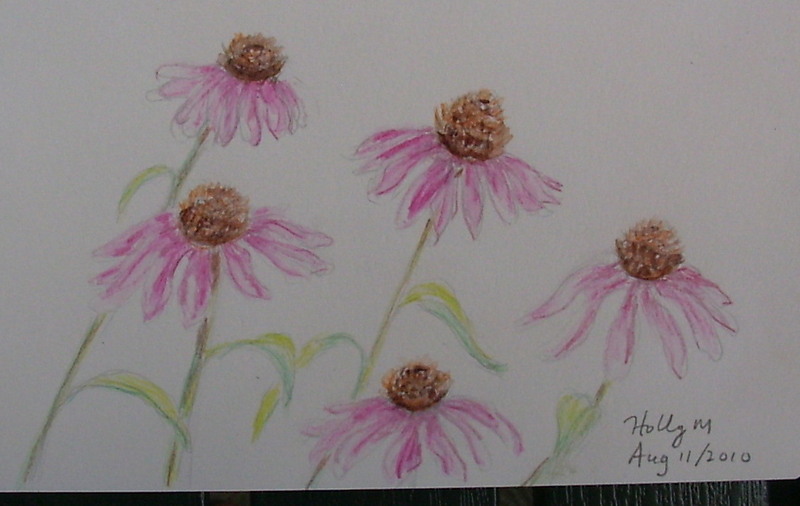 After taking another little food break--small amounts seem to work better-- I moved to the swing on my deck where I read for a bit and did this little sketch of the cone flowers using watercolor pencils. 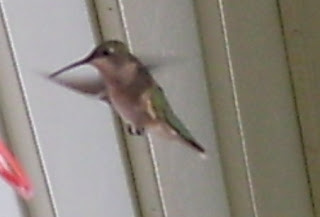 The garden birds were fluttering all around though not cooperating for pictures. I've been trying all summer to get some of our hummingbirds and was pleased to finally get a couple after watching them flutter around the feeder all afternoon. The picture is a little blurry because of cropping but better than any I've gotten yet. 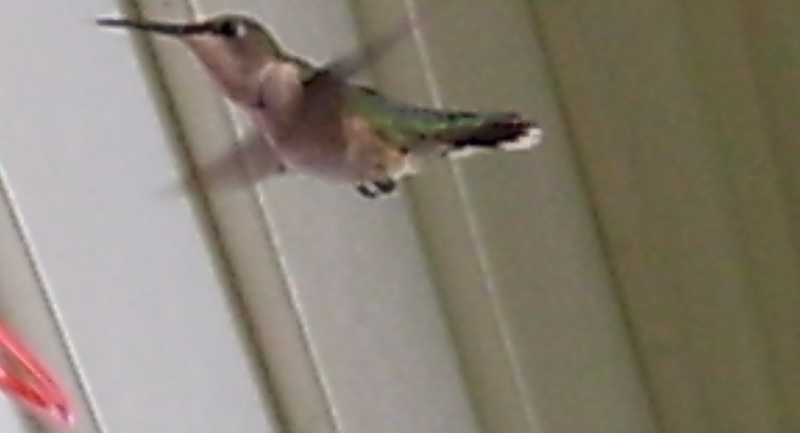 I dream of someday getting a camera with a better zoom. I'm living in a fog again since I came home; I think it may have something to do with a very slight reduction that I made in my cortisone that I take for Addison's. I was on the same dose for a month and waited until vacation to make another reduction. While I am at a very safe dose as far as side effects right now, I could still take a little less. Because of all my other health problems at the moment any little change affects me. It's very frustrating; I'm trying to be patient and keep telling myself we'll get to the bottom of it all once all the tests are done. 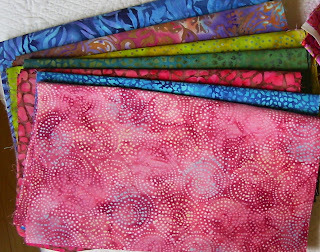 After I came home, I rested most of the afternoon, and then last night I pulled out the fabrics that I got in the swap at our guild. They are to be used in a challenge to be finished for the first meeting in September. I'm a little slow getting started although I've had an idea of what I want to do for a while. 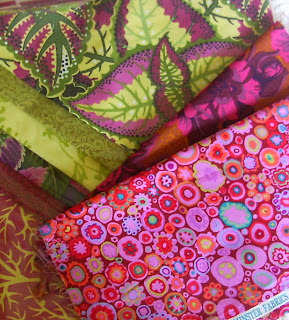 It has to be a secret until it's revealed at the first meeting, so I cannot show my sketches or my work, but here are some of the fabrics laid out. It is quite an assortment, but I think it will work for what I have in mind. I would be very interested to hear some other suggestions from anyone out there. Today, my husband got me out for my little bit of bike riding early in the morning and this afternoon we visited his parents at the beach. We purchased a piece of trout for supper and he did it on the barbecue. To go with the fish he put on a pot of fresh garden carrots and string beans that came from our little garden patch. 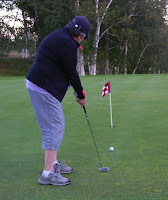 I was so tired that I didn't help much, but after eating I felt a little better. I finally got around to cutting up some rhubarb that I picked a few days ago and I made these muffins. They are from one of my favorite recipes that I use regularly and change the ingredients to suit the supply. 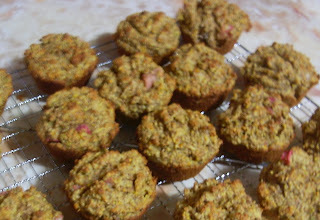 They are very hearty with oat bran, bran, flax meal, and whole wheat flour. The wet ingredients are pureed in the blender and include 2 whole cut up oranges. 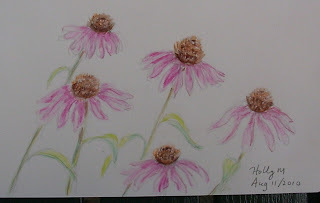 It felt like a major accomplishment as I'd been trying to work up the energy to do them for days. 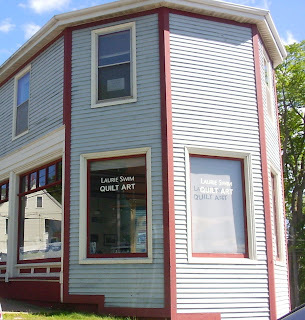 Yesterday was a very hot and humid day, and lucky for me , I spent the day with 2 quilting friends at a cottage on the Pokemouche River, NB. As you can see in the picture, it is beautiful there-- a real paradise. 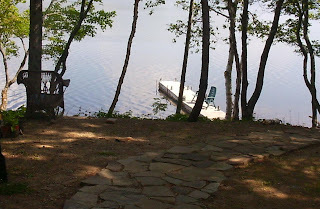 The first thing we did was to drink our tea and coffee on the dock before retreating to the deck for some relaxed stitching. The river was so calm and warm that I did a 20 minute swim fro a bit of morning exercise as a bit of (I hoped) blood sugar control. We ate lunch outside accompanied by the sounds of a quick thunder storm and a deluge of rain. Of course there was lots of chat; one friend commented that "we had solved all the world's problems." After that we moved inside for some more stitching and a movie while we ate supper. We had one more session on the dock before heading home. It was a perfect day! 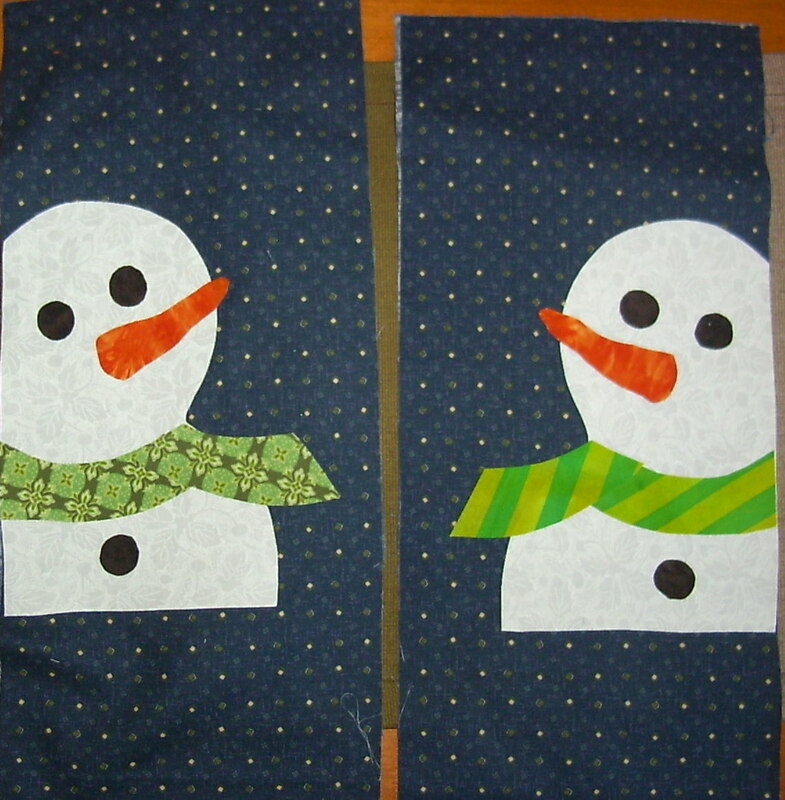 Here are the 2 little pieces that I put the finishing touches on. 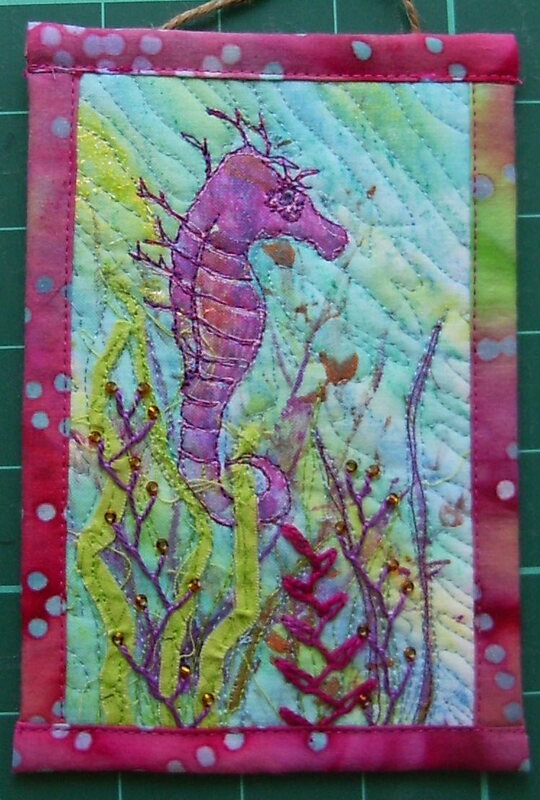 The seahorse is 4 by 6 and the seashell is about 11 !/2 by 13 !/2 inches. I realized on our drive home that we wove our way from New Brunswick to PEI, back to New Brunswick, then Nova Scotia and 11 days later, back to NB. 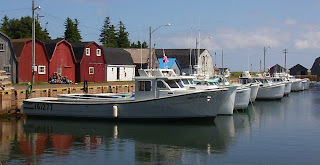 In PEI we had a potluck picnic on my brother's cottage deck and I managed to see 7 nieces and nephews, 1 grand nephew, 3 brothers, 1 sister, the spouses, and my mother and her husband. 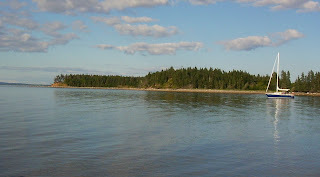 It was wonderful a wonderful at the beach and of course we had lots of good Island seafood and fresh vegetables. I showed a couple of landscape pictures in my last post and I saved this one for the fabric and yarn purchases, as well as a gift (belated Mother's Day) that I received from my son and his partner which I just love. It is carved from a tree; you can still see some of the bark. Isn't it sweet? 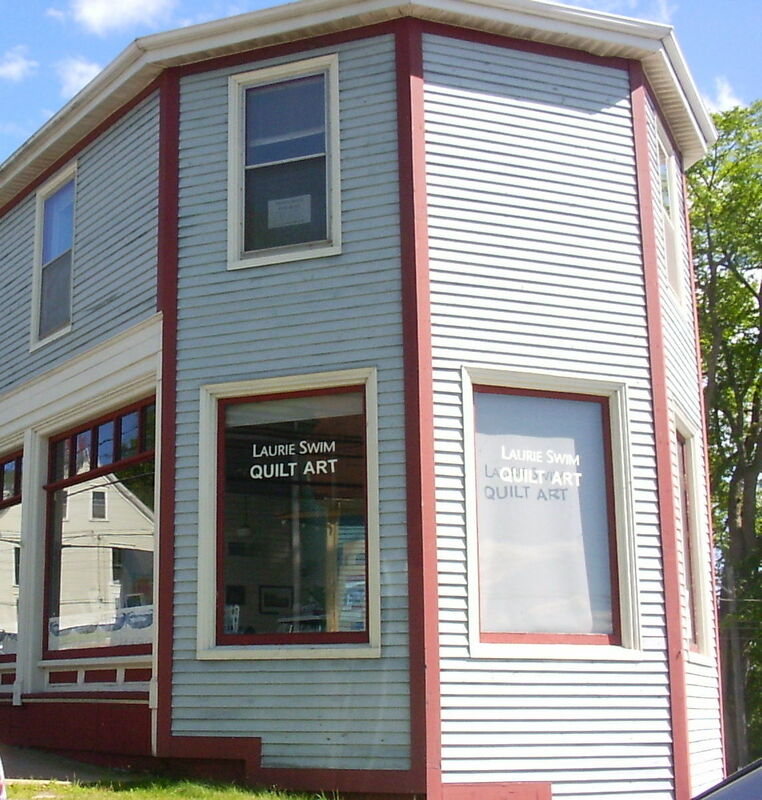 It was purchased from one of my favorite spots- the Lahave bakery and cafe which also houses a craft shop downstairs. The food there is tasty and wholesome- lots of hearty breads, soups and lovely deserts. 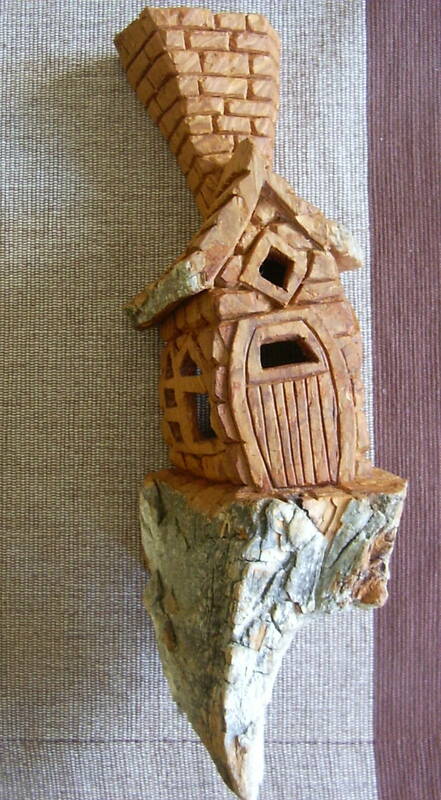 This carving is about 12 inches long. 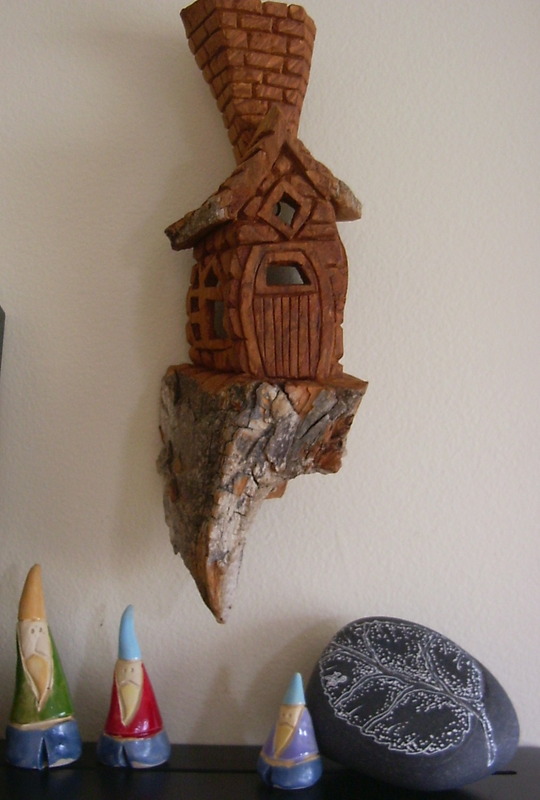 I haven't yet decided where it will reside. 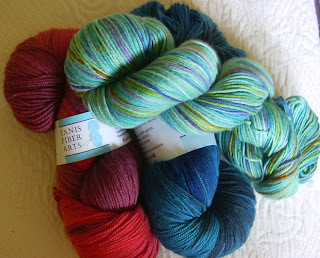 In Nova Scotia, I visited 2 yarn stores- the Loop Craft Cafe in Halifax and another in Mahone Bay called Have a Yarn where I purchased 2 balls of a beautiful hand dyed Merino wool and one ball of a silk cotton mix. 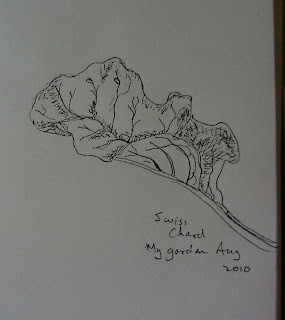 I wanted to do more sketching outside but time and weather didn't always cooperate. 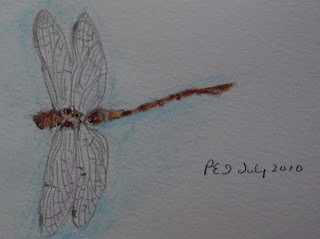 Here's a little one of a dragonfly that I did inside the cottage in PEI on a rainy day. My husband found him on the front grill of the car, which explains its crookedness. The funny thing is that when we got home to Bathurst and went out to the beach to visit my husband's parents, my mother-in-law had saved me a perfect one that she found on her deck. Finally, I can't resist showing a couple more photos. 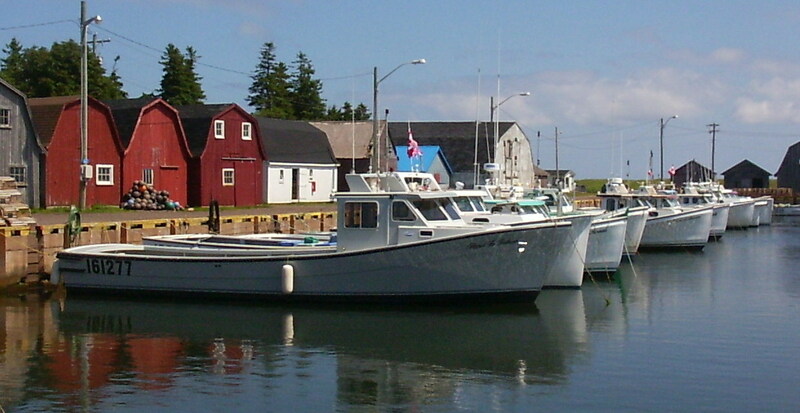 This is one of the harbor in Malpeque bay, PEI. We rode there on our bicycles and ate lunch there one day. 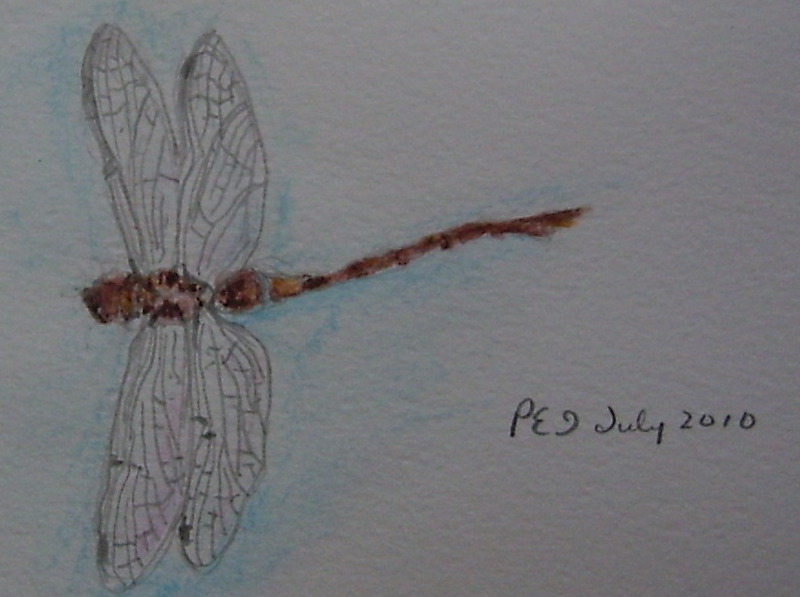 I did a small sketch there, but it was so hot that I wrapped it up quickly, so it's not quite finished. I'll be reliving this vacation many times until next year. We arrived home around 7:30 PM after 7 or so hours on the road. We quickly unloaded the basics and unpacked a bit the necessities. I checked on my garden and then I had a soak in the tub. It's so nice to be home. 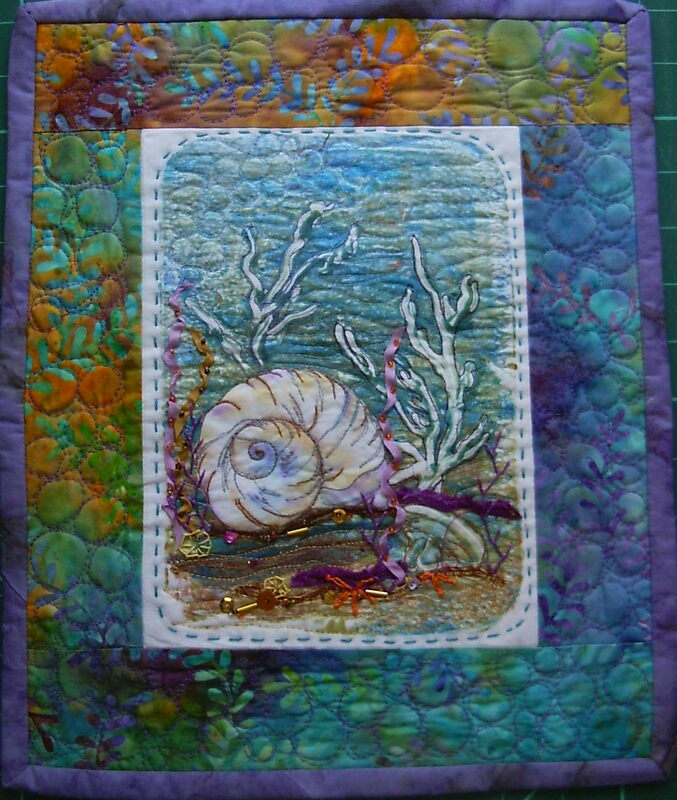 I had canceled my 3 day with Laurie Swim which i don't regret, as I really was not up to it, but I visited her at her studio and she suggested I sit in for the first day which I did and it was great. 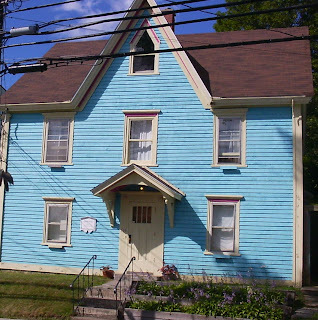 I don't have any pictures from that yet, but here is a picture of her studio in Lunenburg, and also an example of an historic house which is opposite her studio. I will write some more another time, as I'm beat, but here is one more picture from the beach where we had a picnic last night with my son and his girl friend..